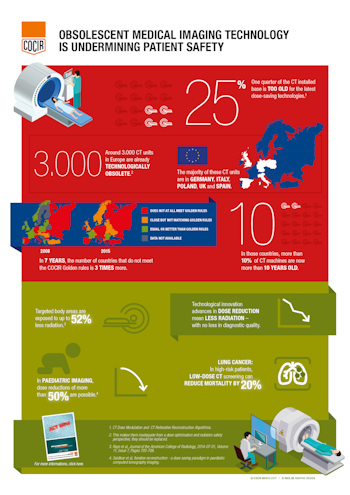 The European Coordination Committee of the Radiological, Electromedical, and Healthcare IT Industry (COCIR) launched a new infographic as part of the EuroSafe Imaging presence at ECR 2017 to address the deterioration of medical imaging equipment. A quarter of the European CT installed base (approximately 3,000 units) are no longer capable of being upgraded with the latest technological advances, including CT dose modulation and CT reiterative reconstruction algorithms, which can reduce the required radiation dose, COCIR said. The new infographic shows the number of countries failing to meet the COCIR "Golden Rules" has tripled. 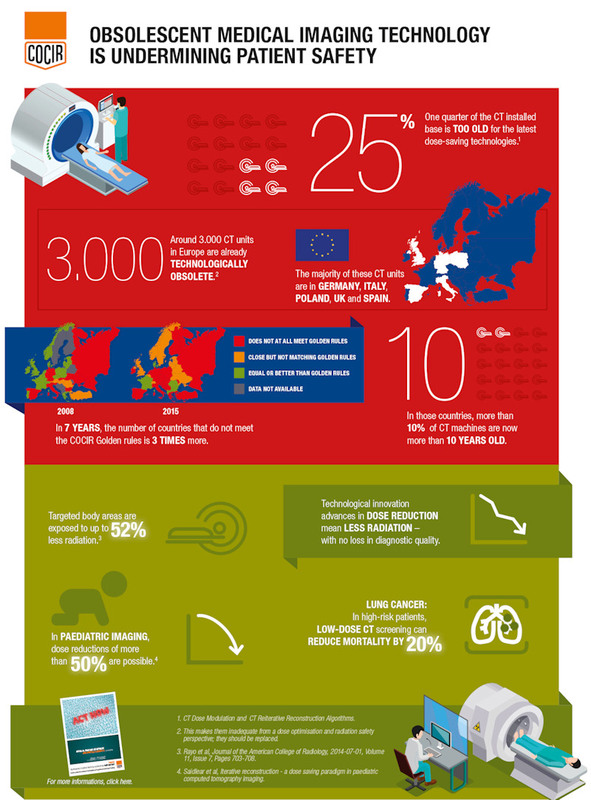 COCIR has launched a new infographic to address the deterioration of medical imaging equipment. "It is vital that we repeat the alarm call we first raised in 2014," COCIR Secretary General Nicole Denjoy said. "Once again, we urge healthcare providers to replace aging and outdated equipment as part of a more patient-centric approach to advancing safety." Replacing equipment is beneficial to patients as advances in technology over the last 10 years provide faster, higher-quality images, improve many types of examination, reduce radiation dose, and make a significant contribution to reducing mortality, COCIR said.